Here in Phoenix, running the air conditioning is something most people do through a big chunk of the year. The heat can be unbearable at times. But just because you are running the AC doesn’t mean you need to break the bank to stay cool. There are some common mistakes that homeowners make that result in energy bills being much higher than needed. We’re going to take a look at some of those mistakes today, as well as offering some helpful hints for how you can improve your own household’s efficiency. Just because it’s large does not mean that it will cool down the air in your house faster. They are often inefficient due to short cycles, which means they start up and shut down much more often. This increases energy usage without accomplishing what you want it to. Additionally, they won’t reduce the humidity effectively and depending on size, may contribute to the heat output in the home just by running. We previously wrote about finding the right size air conditioner for your home here, so be sure you read through that to help find what fits your living space. Many people will set the temperature they are comfortable with and won’t adjust it at all. 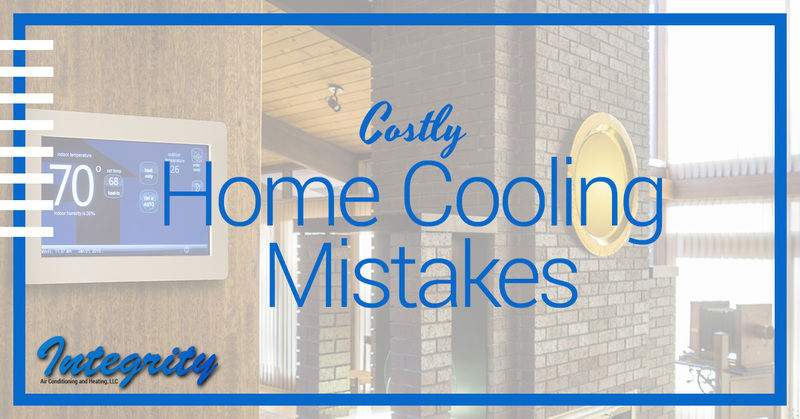 While this may guarantee that you walk into an icebox when you get back home, you’re not only raising your energy costs; you’re overworking your air conditioner and reducing its lifespan. We recommend getting a programmable thermostat which you can set to a higher temperature while you’re not at home and cool it down when you get back. Lowe’s has a pretty fantastic tutorial on how to install your own programmable thermostat here. While it is not an issue to have the fan on high during most days, it’s recommended to run it at low speed when it’s particularly humid out. The slower air movement can actually remove the moisture from the air, making for a much more comfortable environment to be in. Sure, air conditioners aren’t always the most attractive feature of your home, but hiding them doesn’t do any good. By covering it up with a plant or furniture, you’re making it work much harder to get its job done. It will also clog up the unit’s condenser coils and impede the ventilation needed to work properly. So give it a little room to breathe and you’ll see the improvement almost immediately. AC Units aren’t as self-sufficient as you may think. If you’re running them often or they’re handling a large amount of dust and pet hair, the filters are going to get clogged and reduce the unit’s efficiency. It’s recommended to either replace or clean the filters every few weeks to keep everything running properly. Running appliances like a dryer or dishwasher in the heat of the day will raise the overall temperature of your home. This is especially true when these appliances are near your thermostat. It will read how hot it is right near it and increase the workload of the air conditioner to compensate, despite it being nice and chilly in the rest of the house. Running those appliances at night helps to avoid unnecessary temperature increases during the day. If possible, make sure your thermostat is located away from these heat generators to lessen their effect as well. The EPA reports that duct systems can lose 20-30% of cooled air due to holes and leaks. We here at Integrity AC and Heating would be happy to inspect your ductsfor any of these leaks to make sure they are sealed and ensure you’re not letting money blow away. You’ll also want to make sure all doors and windows are sealed properly to prevent the air from escaping from there as well. The Department of Energy has a couple of very helpful articles about weatherstripping and caulking to maintain those seals easily. These are just a few of the common mistakes we have encountered. Hopefully, this will help you lower your energy bills in a meaningful way. Give us a call today and we’ll be more than happy to lend our expertise in search of a cooler, more efficient home.